The nursing diagnosis Fluid Volume Deficit (also known as Deficient Fluid Volume) is defined as decreased intravascular, interstitial, and/or intracellular fluid. This refers to dehydration, water loss alone without change in sodium. 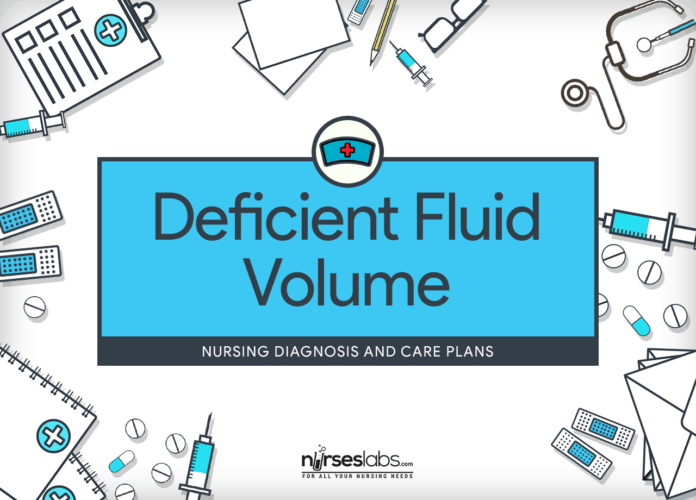 Use this nursing diagnosis guide to develop your fluid volume deficit care plan. Deficient fluid volume is a state or condition where the fluid output exceeds the fluid intake. It happens when water and electrolytes are lost as they exist in normal body fluids. Common sources of fluid loss are the gastrointestinal tract, polyuria, and increased perspiration. Risk factors for FVD are as follows: vomiting, diarrhea, GI suctioning, sweating, decreased intake, nausea, inability to gain access to fluids, adrenal insufficiency, osmotic diuresis, hemorrhage, coma, third-space fluid shifts, burns, ascites, and liver dysfunction. Fluid volume deficit may be an acute or chronic condition managed in the hospital, outpatient center, or home setting. Appropriate management is vital to prevent potentially life-threatening hypovolemic shock. Older patients are more likely to develop fluid imbalances. The goals of management are to treat the underlying disorder and return the extracellular fluid compartment to normal, to restore fluid volume, and to correct any electrolyte imbalances. Patient is normovolemic as evidenced by systolic BP greater than or equal to 90 mm HG (or patient’s baseline), absence of orthostasis, HR 60 to 100 beats/min, urine output greater than 30 mL/hr and normal skin turgor. Patient demonstrates lifestyle changes to avoid progression of dehydration. Patient verbalizes awareness of causative factors and behaviors essential to correct fluid deficit. Patient explains measures that can be taken to treat or prevent fluid volume loss. Assessment is necessary in order to identify potential problems that may have lead to Deficient Fluid Volume as well as name any episode that may occur during nursing care. Monitor and document vital signs especially BP and HR. Decrease in circulating blood volume can cause hypotension and tachycardia. Alteration in HR is a compensatory mechanism to maintain cardiac output. Usually, the pulse is weak and may be irregular if electrolyte imbalance also occurs. Hypotension is evident in hypovolemia. Assess skin turgor and oral mucous membranes for signs of dehydration. Signs of dehydration are also detected through the skin. Skin of elderly patients losses elasticity, hence skin turgor should be assessed over the sternum or on the inner thighs. Longitudinal furrows may be noted along the tongue. Greater than 10 mm Hg drop: circulating blood volume is decreased by 20%. Greater than 20 to 30 mm Hg drop: circulating blood volume is decreased by 40%. Orthostatic hypotension caused by volume depletion is associated with a compensatory increase in HR (more than 20 beats/min). Assess alteration in mentation/sensorium (confusion, agitation, slowed responses) Alteration in mentation/sensorium may be caused by abnormally high or low glucose, electrolyte abnormalities, acidosis, decreased cerebral perfusion, or developing hypoxia. Impaired consciousness can predispose patient to aspiration regardless of the cause. Assess color and amount of urine. Report urine output less than 30 ml/hr for 2 consecutive hours. A normal urine output is considered normal not less than 30ml/hour. Concentrated urine denotes fluid deficit. Monitor and document temperature. Febrile states decrease body fluids by perspiration and increased respiration. This is known as insensible water loss. Monitor fluid status in relation to dietary intake. Most fluid comes into the body through drinking, water in food, and water formed by oxidation of foods. Verifying if the patient is on a fluid restraint is necessary. Note presence of nausea, vomiting and fever. These factors influence intake, fluid needs, and route of replacement. Auscultate and document heart sounds; note rate, rhythm or other abnormal findings. Cardiac alterations like dysrhythmias may reflect hypovolemia and/or electrolyte imbalance, commonly hypocalcemia. Note: MI, pericarditis, and pericardial effusion with/ without tamponade are common cardiovascular complications. Monitor serum electrolytes and urine osmolality, and report abnormal values. Elevated blood urea nitrogen suggests fluid deficit. Urine specific gravity is likewise increased. Ascertain whether the patient has any related heart problem before initiating parenteral therapy. Cardiac and older patients are often susceptible to fluid volume deficit and dehydration as a result of minor changes in fluid volume. They also are susceptible to the development of pulmonary edema. Weigh daily with same scale, and preferably at the same time of day. Weight is the best assessment data for possible fluid volume imbalance. An increased in 2 lbs a week is consider normal. Identify the possible cause of the fluid disturbance or imbalance. Establishing a database of history aids accurate and individualized care for each patient. Monitor active fluid loss from wound drainage, tubes, diarrhea, bleeding, and vomiting; maintain accurate input and output record. Fluid loss from wound drainage, diarrhea, bleeding, and vomiting cause decreased fluid volume and can lead to dehydration. During treatment, monitor closely for signs of circulatory overload (headache, flushed skin, tachycardia, venous distention, elevated central venous pressure [CVP], shortness of breath, increased BP, tachypnea, cough) during treatment. Close monitoring for responses during therapy reduces complications associated with fluid replacement. Monitor and document hemodynamic status including CVP, pulmonary artery pressure (PAP), and pulmonary capillary wedge pressure (PCWP) if available in hospital setting. These direct measurements serve as optimal guide for therapy. Monitor for the existence of factors causing deficient fluid volume (e.g., gastrointestinal losses, difficulty maintaining oral intake, fever, uncontrolled type II diabetes mellitus, diuretic therapy). Early detection of risk factors and early intervention can decrease the occurrence and severity of complications from deficient fluid volume. The gastrointestinal system is a common site of abnormal fluid loss. Urge the patient to drink prescribed amount of fluid. Oral fluid replacement is indicated for mild fluid deficit and is a cost-effective method for replacement treatment. Older patients have a decreased sense of thirst and may need ongoing reminders to drink. Being creative in slecting fluid sources (e.g., flavored gelatin, frozen juice bars, sports drink) can facilitate fluid replacement. Oral hydrating solutions (e.g., Rehydralyte) can be considered as needed. Aid the patient if he or she is unable to eat without assistance, and encourage the family or SO to assist with feedings, as necessary. Dehydrated patients may be weak and unable to meet prescribed intake independently. If patient can tolerate oral fluids, give what oral fluids patient prefers. Provide fluid and straw at bedside within easy reach. Provide fresh water and a straw. Most elderly patients may have reduced sense of thirst and may require continuing reminders to drink. Emphasize importance of oral hygiene. Fluid deficit can cause a dry, sticky mouth. Attention to mouth care promotes interest in drinking and reduces discomfort of dry mucous membranes. Provide comfortable environment by covering patient with light sheets. Drop situations where patient can experience overheating to prevent further fluid loss. Plan daily activities. Planning conserves patient’s energy. Insert and IV catheter to have IV access. Parenteral fluid replacement is indicated to prevent or treat hypovolemic complications. Administer parenteral fluids as prescribed. Consider the need for an IV fluid challenge with immediate infusion of fluids for patients with abnormal vital signs. Fluids are necessary to maintain hydration status. Determination of the type and amount of fluid to be replaced and infusion rates will vary depending on clinical status. Administer blood products as prescribed. Blood transfusions may be required to correct fluid loss from active gastrointestinal bleeding. Maintain IV flow rate. Stop or delay the infusion if signs of fluid overload transpire, refer to physician respectively. Most susceptible to fluid overload are elderly patients and require immediate attention. Assist the physician with insertion of central venous line and arterial line, as indicated. A central venous line allows fluids to be infused centrally and for monitoring of CVP and fluid status. An arterial line allows for the continuous monitoring of BP. Provide measures to prevent excessive electrolyte loss (e.g., resting the GI tract, administering antipyretics as ordered by the physician). Fluid losses from diarrhea should be concomitantly treated with antidiarrheal medications, as prescribed. Antipyretics can decrease fever and fluid losses from diaphoresis. Begin to advance the diet in volume and composition once ongoing fluid losses have stopped. Addition of fluid-rich foods can enhance continued interest in eating. Encourage to drink bountiful amounts of fluid as tolerated or based on individual needs. Patient may have restricted oral intake in an attempt to control urinary symptoms, reducing homeostatic reserves and increasing risk of dehydration or hypovolemia. Educate patient about possible cause and effect of fluid losses or decreased fluid intake. Enough knowledge aids the patient to take part in his or her plan of care. Enumerate interventions to prevent or minimize future episodes of dehydration. Patient needs to understand the value of drinking extra fluid during bouts of diarrhea, fever, and other conditions causing fluid deficits. Emphasize the relevance of maintaining proper nutrition and hydration. Increasing the patient’s knowledge level will assist in preventing and managing the problem. Teach family members how to monitor output in the home. Instruct them to monitor both intake and output. An accurate measure of fluid intake and output is an important indicator of patient’s fluid status. Refer patient to home health nurse or private nurse in able to assist patient, as appropriate. Continuity of care is facilitated through the use of community resources. Identify an emergency plan, including when to ask for help. Some complications of deficient fluid volume cannot be reversed in the home and are life-threatening. Patients progressing toward hypovolemic shock will need emergency care.